← Fast Food Feeding Frenzy No More? 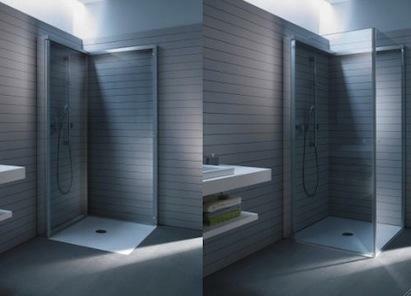 This shower enclosure design by Duravit is pretty genius. The glass shower enclosure folds against the wall to both increase the usable floor space of a bathroom and to conceal the shower fittings. And one of the enclosure walls can be mirrored to serve as a full-length mirror. I’m a little skeptical about water leaking underneath the enclosure when showering, but the design is beautiful and so simple. This entry was posted in Design Products. Bookmark the permalink.